Hackney – Modern, Restored, Forgotten, Ignored features 40 buildings to commemorate the 40th anniversary of the Hackney Society. 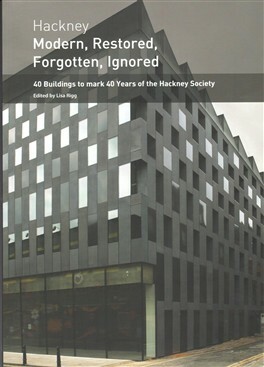 Written by 40 authors the book seeks to draw attention to good-quality modern architecture; recent restoration projects; buildings that have been lost; and buildings that are currently at risk from neglect or demolition. Buildings include Rogers Stirk Harbour and Partners' award-winning Mossbourne Community Academy; Frank Matcham’s masterpiece, the Hackney Empire; Eton Manor Boys’ Club – a lost sporting institution; and the New Lansdowne Club, one of Hackney's oldest and 'at risk' houses. The book is lavishly illustrated with over 155 historic and contemporary photographs. Thirty-six of these are reproduced in full colour. Contributors: Allen Abramson, Geraldine Bedell, Monica Blake, Paul Bolding, Heloise Brown, Chris Dorley-Brown, Tom Dyckhoff, Laurie Elks, Amy Erickson, Haggerston Pool Community Trust, Patrick Hammill, David Heath, Nick Holder, Tim Horsey, Sharman Kadish, Julia Lafferty, Patrick Lynch, Chris Miele, Kevin Moore, John O’Callaghan, Matt Payne, Lisa Rigg, Ann Robey, Elizabeth Robinson, Ray Rogers, Tim Ronalds, Joanna Smith, David Solman, Cathy Strongman, Vyki Sparkes, Amin Taha, Jerry Tate, Anthony Thistleton, John Turner, Patrick Vernon, Suzanne Waters, Isobel Watson, Margaret Willes, Sarah Wise and Ken Worpole. ISBN: 978-0-9536734-1-4, 170pp, 155 photographs. Thirty-six in full colour. This page was added on 11/09/2009.